It has taken 27 years for Stephen Sondheim’s 1987 musical — Into the Woods — to reach the screen. I wish I could say it was totally worth the wait. But under the direction of Rob Marshall (Chicago and Nine), this megaton Disney production arrives as a mixed blessing with highlights built around Meryl Streep’s performance as The Witch, Anna Kendrick’s turn as Cinderella, Emily Blunt’s portrayal of a baker’s wife and a couple of signature musical numbers. A mash-up of a story incorporates fragments of various, iconic fairy tales: Little Red Riding Hood, Rapunzel, Cinderella and Jack and the Beanstalk. Shards from these stories are united by the tale of a baker and his wife. The couple tries to gather ingredients needed to break a spell (cast by the witch, of course) that has left them childless. Credit Marshall with getting the musical off to a rousing start. The opening introduces the major characters in lively, amusing fashion before all head for the woods on a variety of personal quests that sometimes turn sluggish. For the most part, the movie is well cast. Under a ton of make-up, Streep brings life to every scene in which she appears. James Corden and Blunt are fine as the baker and his wife, and Kendrick makes for a somewhat different Cinderella, a young woman who isn’t entirely star struck by the handsome prince (Chris Pine). Pine, by the way, brings self-absorbed superficiality to the role of the prince, complementing the movie’s desire to upend as many fairy-tale stereotypes as possible. A high point arrives when Red Riding Hood meets the wolf (Johnny Depp made up like a predatory Zoot-suiter). The wolf leers after Red Riding, displaying a lecherous streak. Depp licks his chops, and then vanishes from the screen with a demonstrative howl. Carefully designed by Dennis Gassner, Into the Woods has a lavish quality that Marshall supplements with special effects when necessary. The singing — a key in a musical without big dance numbers — seems mostly up to snuff, although I have no standard of comparison, never having seen Into the Woods on stage. The movie’s screenplay — by James Lapine — reportedly includes a bit of compression and the filing down of a few rough edges, but I leave all that for Sondheim enthusiasts to sort out. 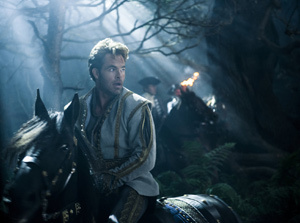 Into the Woods increasingly darkens as it goes against the grain of the original fairy tales. A faux happily ever-after ending is followed by a lengthy final act which goes to great pains to subvert expectations and which, alas, tested my patience. I found myself longing for this one to conclude before it had worked its way through all of its 124-minute length, but — in fairness - I’d have to say that Into the Woods seemed acceptable, if not a candidate for movie musical greatness. What’s missing? Goosebumps and a sustained sense that we’re watching something that gets beyond its ever-present cleverness.